Dr. Cindy Waters, professor emerita; Sue Burrack, assistant professor of education and Dr. Dawn Jacobsen, associate professor of education presented Technology and UDL: Meeting Challenges and Increasing Opportunity at the Magna Teaching Professor Conference in Atlanta, Georgia, in June 2018. 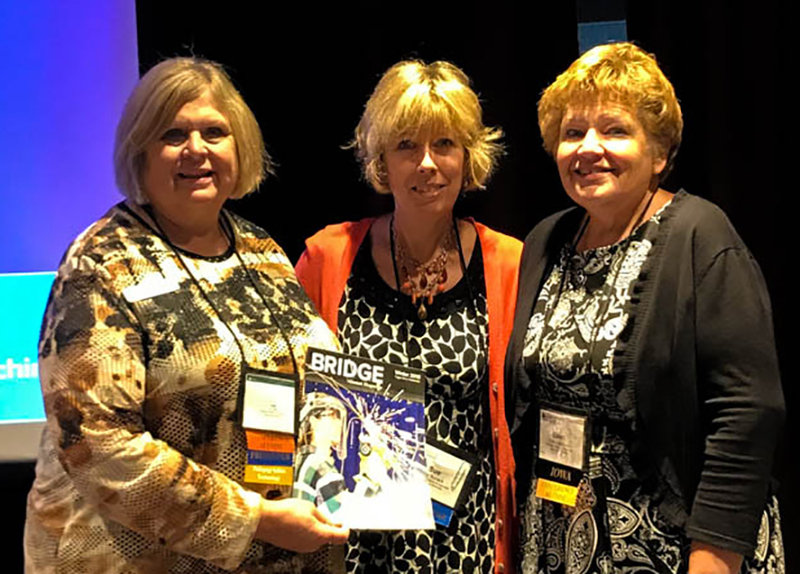 In addition, the three UIU faculty presented Challenge Accepted: Integrating Growth Mindset at the Special Education Conference in Wisconsin Dells, Wisconsin, in November 2018. 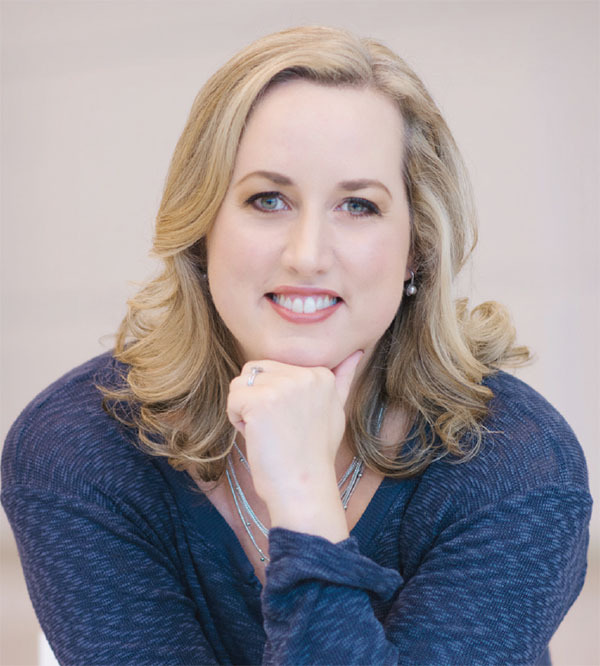 Dr. Billie Jo Cowley ’03, ’08 associate professor of education and Laura Heddleson endowed chair in education, published “Building Relationships with Students who have Experienced Trauma” in the fall 2018 issue (20.2) of Southeast Educator Network magazine. A link to the magazine and article can be found at seenmagazine.us. Cowley also presented “Mental Illnesses and the Overlap with Trauma Informed Care” at the Iowa Culture and Language Conference in November 2018. Angela Leete, associate professor of athletic training, has been selected by the Commission on Accreditation of Athletic Training Education (CAATE) to serve as site visit chair for an upcoming CAATE site visit of another peer institution. Prior to this appointment, Leete has served in the role of a CAATE site visitor at University of Southern Connecticut and University of New Mexico, as well as serving as a site visit team reader for a University of Central Connecticut site visit. Principles Model: A Call to Integrate the 4 P’s into a Strategic Construct” at the Summer AMA Conference in Boston, Massachusetts. Adult Science Fiction and Best Young Adult Books of 2018 by Kirkus Reviews. Earlier in the fall, Finlay had continued her book readings in order to promote her new novel. She gave a reading and class visit at the Archway Reading and Lecture Series at the University of Dubuque in September 2018; participated as an invited author at the Luther College Writers Series in September; as an author’s panel at the Wisconsin Book Festival in October 2018; as a featured author in the High School Friday program at the Wisconsin Public Library in October 2018, and as a participant in an author’s panel at the Las Vegas Book Festival in October 2018. Adjunct Danielle Camacho (Business) co-authored “Sustainability Programs in Business, Universities and K-12: Educating Students and Leaders Toward a Sustainability Mindset,” which has been accepted for publication in Journal of Institutional Research, Volume 7. Tiffany Kragnes ’16, Assistant Professor of Criminal Justice, was selected for the National Society of Leadership and Success and will be inducted upon the completion of her training. Meghan Mettler, Assistant Professor of History, had an article titled “Godzilla versus Kurosawa: Presentation and Interpretation of Japanese Cinema in the Post World War II United States” published in the Journal of American/ East Asian Relations. Dr. Melinda Heinz, Assistant Professor of Psychology, made a poster presentation titled “Transition Adjustment Among College Freshmen” at the 15th annual Drake University Conference on Undergraduate Research in the Sciences (DUCURS) in Des Moines. Dr. Matt Foy, Assistant Professor of Communication, published an article titled “Erecting and Impaling the Monstrous Social Justice Warrior in The Green Inferno,” in The Popular Culture Studies Journal. Upper Iowa University faculty and students participated in the Iowa Cultures and Language Conference in Coralville, Iowa, November 6-7. Dr. Janet Kehe, professor emerita, and Dr. Gina Kuker, professor of education, presented Writing Right: Writing Assignments to Meet the Iowa Core, while Associate Professor of Education Billie Cowley presented Mental Illnesses and the Overlap of Trauma Informed Care at the event. 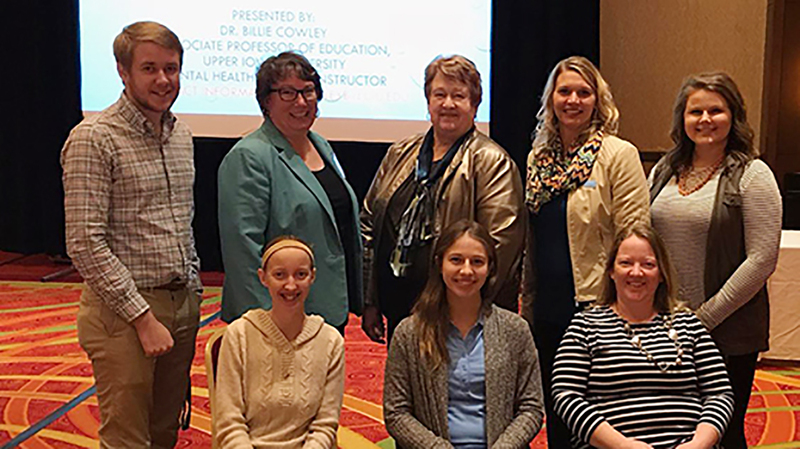 UIU faculty and students attending the 2018 Iowa Cultures and Language Conference in Coralville, Iowa, were (front, l-r) Lindsey Johanningmeier, Megan Gavin, Melissa Shea; (back) Bryce Decker, Dr. Gina Kuker, Dr. Janet Kehe, Dr. Billie Cowley and Jasmine Stocker. In addition, Lindsey Johanningmeier, a senior psychology major from Waukon, Iowa; Megan Gavin, a senior mathematics education major from Fayette, Iowa; Melissa Shea, a junior birth-grade 3 inclusive settings major from Wadena, Iowa; Bryce Decker, a junior elementary education major from Monona, Iowa; and Jasmine Stocker, a senior elementary education major from Elgin, Iowa, introduced the guest speakers at the conference. The Iowa Cultures and Language Conference addresses the issues facing English Language Learners, such as how to advocate for culturally and linguistically diverse students and provide support. Noriza Abu Hassan Shaari, Instructional Designer – Science and Mathematics, presented a paper titled “Effect of Narrative Structures of Animated Movies on Recall and Comprehension” at the E-Learn 2018 World Conference on E-Learning in Las Vegas. Dr. Katherine McCarville, Professor of Geosciences, presented her paper titled “Cultivating Science Literacy in 3D” at the Iowa Science Teaching Section of the Iowa Academy of Science. In addition, McCarville presented a paper titled “A New Look at the Iowan Erosion Surface as a Megaflood Landscape” at the Annual Meeting of the Geological Society of America. Dr. Jennifer Stoffel, Associate Professor of Biology, presented a poster titled “Biodiversity Activity Survey: Breaking the Ice with the Next Generation of Scientists” at the Ecological Society of America Conference in New Orleans. Stoffel also participated in field study trips where she learned more about urban interactions with coastal forested wetlands in the New Orleans Area and how ecological understanding is informing protected area management in the wetland landscape of the Mississippi delta. Dr. Katherine McCarville, Dr. Jennifer Stoffel, and Dr. Rebecca Schmidt, Assistant Professor of Biology, presented a poster titled “Unearthing the Potential Geoscientist: Engaging Students Biochemical Field-Based Research and Service in the Critical Zone” at the Annual Meeting of the Geological Society of America. Amy Tucker, Director of Academic Success, presented “Holistic Support for Rural Students” at the National College Access Network Conference in Pittsburgh, Pennsylvania. The presentation was sponsored by Great Lakes Higher Education Corporation. Kellie A. Walker, Director of Disability Services, recently completed the National Association of ADA Coordinators Professional Associate Program. The Professional Associate is earned by obtaining a total of 66 Association continuing training credits through training sessions within a period of four consecutive years. Adjunct faculty member Ganiyu Jimoh wrote African Students and Their Determination for Education: African Student and Education in reflection to his time spent in Africa. The author explains the story features Lukuman and Fatai, two young brothers from a Nigerian village called Igbogila. The siblings come from a large family living in a jungle where the roaring of lions and trumpeting of elephants is commonplace. Obtaining enough food to survive through hunting and growing is a daily struggle. Every day after school, the two brothers join their parents in the jungle to cultivate cocoa seeds, which they sell to the coffee traders who often visit their village. They use the money to buy school uniforms, books and school supplies. Although the work is hard, Lukuman and Fatai are determined to gain an education, and their efforts pay off, showing that we can achieve goals that seem impossible when we refuse to be stopped. Currently, the author serves as captain chief of operations within the Baton Rouge City Constable office along with teaching criminal justice and other related project courses at the UIU-Baton Rouge Center. 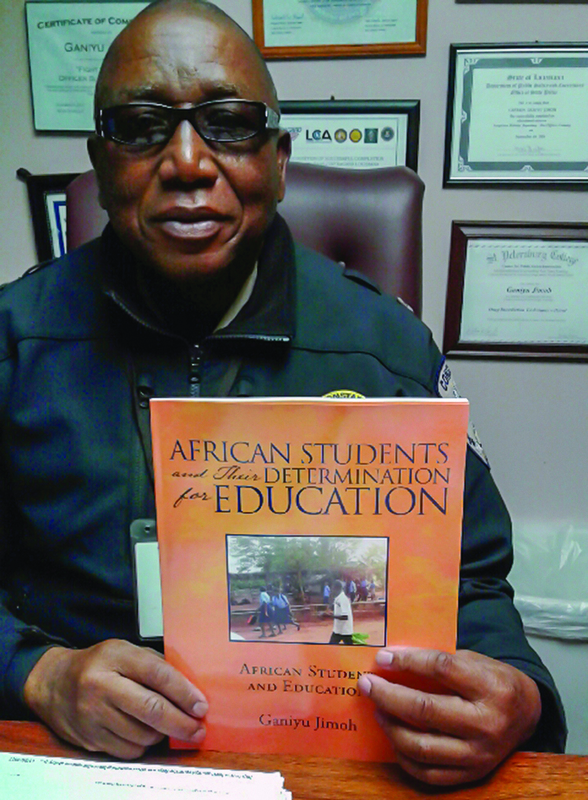 A veteran of the U.S. Armed Forces, Jimoh has worked in law enforcement approximately 15 years. Formerly serving as the constable’s judicial enforcement sergeant, his duties have also included serving as a fusion liaison officer, defensive tactics instructor, director of the Baton Rouge Reserve Academy, and as a member of the Delta Task Force, Anti-Human Trafficking Task Force and Infragard. He and his wife, Lydia, have five daughters. African Students and Their Determination for Education: African Student and Education is currently available on Amazon. A portion of the proceeds goes toward the building of a Baton Rouge community activity center’s after-school tutorial program. Any remaining funds will go toward the purchase of school buses in Africa.